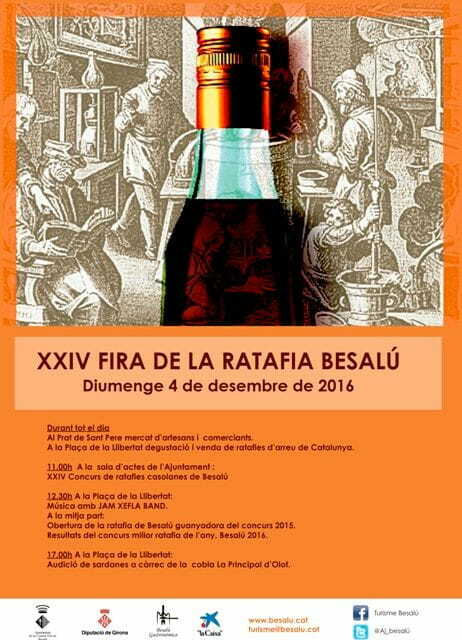 Like every year at this time, reaches Besalú the Ratafia Fair. It is a craft market, shows, tasting and sale of ratafia from all Catalonia. As always, the best ratafia of the year will be choosen at Besalú. The competition involved 25 people. The terms and condition state that the they must live in Besalú in order to obtain a typical and traditional typical product because, once the winner is chosen by experts, they proceeds to pack 700 bottles of liquor. There will be also a tasting and sale of ratafia from Catalonia in Plaça de la Llibertat and a market of local products and artisans in El Prat de Sant Pere. All acts of Ratafia Fair will take place in less than 2 minutes walk from our apartments, so if you are planning to book accommodation in Besalú we still have vacancies. Do not hesitate to contact us to have a good weekend in an apartment house in the Garrotxa!